The very first Grand Prix de Monaco took place on April 14th, 1929. It was created as to bring international prestige to the Principality. 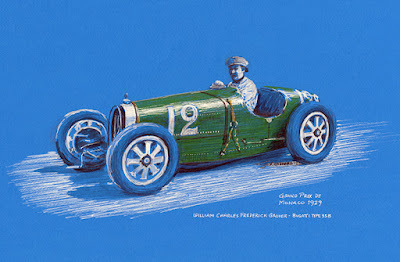 Sixteen drivers participated in that inaugural race, including Rudolf Caracciola, René Dreyfus, Philippe Étancelin and William Charles Frederick Grover-Williams. That first race was won by Grover-Williams racing a Bugatti Type 35B. I decided to create an artwork showing him in his Bugatti, and had a B&W photo as reference. I did the art on blue paper, as most often Bugatti's were in French racing blue. After starting the art, I found out that he was racing in British racing green, so I used a yellow marker on the blue paper to get the green.